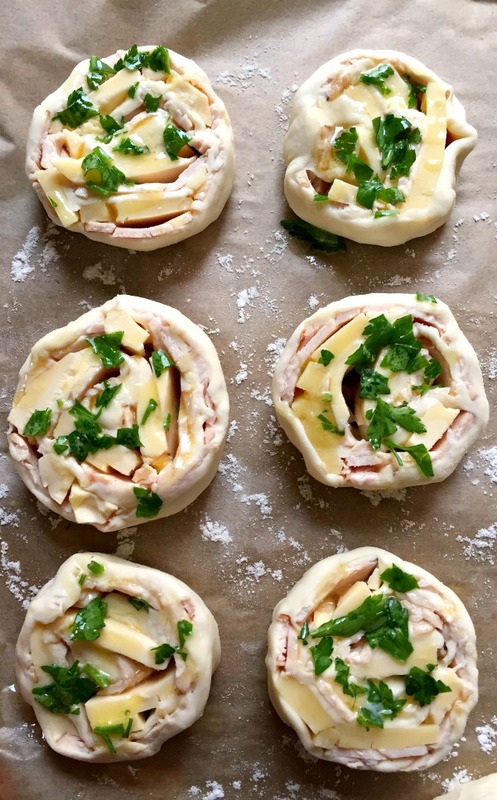 Puff Pastry Pinwheels with Ham and Cheese, a fancy appetizer for any family gathering, party or picnic. Easy to make, with a delicate smokey flavour, these bites will not last long on the plate. Make sure you grab one before they are gone! Don’t you just love it when you can come up with some nice dished without putting too much effort into it? Especially when you have a rather long list of other goodies to bake and you wonder if you’ll ever finish on time. Let’s be honest, parties can be exhausting if you don’t plan them properly, especially if we think of the very important ones like Christmas and New Year, not to mention birthdays. But, yes, they are the best times, when you get to spend time with the nearest and dearest and enjoy all the yummy stuff. But before you have time to relax, lots to do. Way too much!!! I could do with a helping hand!! !So, my recipe will surely come as a big help. All you need is ready-rolled puff pastry, a few slices of cooked ham and some of your favourite cheese, a bit of parsley and job done. 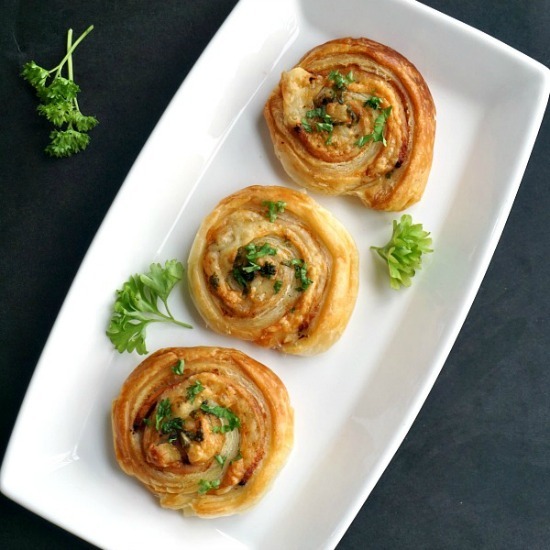 Get these puff pastry pinwheels in the oven and carry on with other dishes. It’s that simple! I used smoked cheese for my pinwheels and the flavour was lovely, it really made a good pair with the ham. If you happen to have leftover ham, that would do too, just slice it thinly so rolling can be easier. You can also replace the ham with turkey or chicken, it’s all up to you. Otherwise, just enjoy the party, the food is amazing! Kids will particularly like these pinwheels, and you can make them with pretty much any filling, either sweet or savoury. The choices are endless: chicken, turkey, tomato sauce and veggies, and you can some nice pizza pinwheels, pesto, cream cheese, strawberries, and so much more. They can be enjoyed for breakfast or as a snack, those little tummies won’t have enough of them. Even my baby had a go, she wasn’t too impressed with the flaky bit, I think she was frustrated that she could not munch on it properly, but she definitely will love them when she grows up a bit. 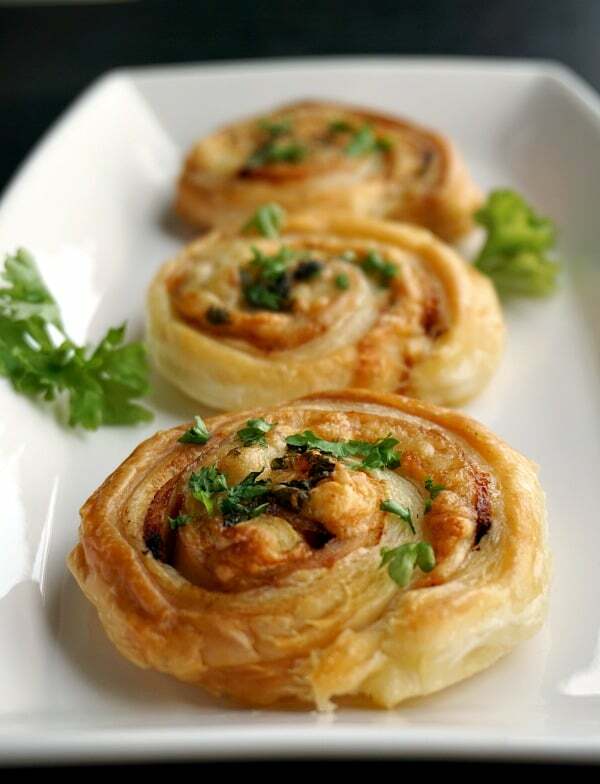 A delicious choice when you are stuck and don’t know what else to cook, and there you have, some yummy pinwheels in less than 30 minutes. 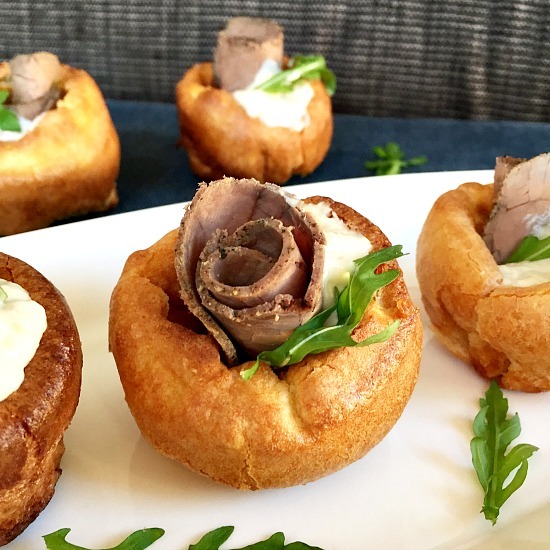 If you’ve liked my PUFF PASTRY PINWHEELS or any other recipe on the blog then don’t forget to rate the recipe and let me know how you got on in the comments below, I love hearing from you! You can also FOLLOW ME on FACEBOOK, and PINTEREST to see more delicious food and what I’m getting up to. 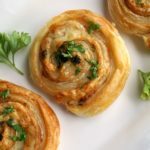 These savoury puff pastry pinwheels with ham and cheese have a delicate smokey flavour, are scrumptiously golden and so delicious. Great bites for any celebration or why not, a nice picnic. Roll the puff pastry on the work surface. Arrange the turkey slices , then the cheese slices on top. Preheat the oven to 200 degrees C (400 degrees Fahrenheit). 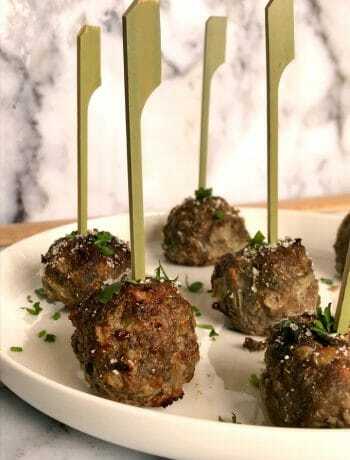 Melt the butter and add the chopped parsley to it, then brush each pinwheel with the mixture. Garnish with more parsley if you wish. Wow.. this is looks so so yummy. Can’t wait to cook for my kids, they would absolutely fall in love with this one.this is so tasty. 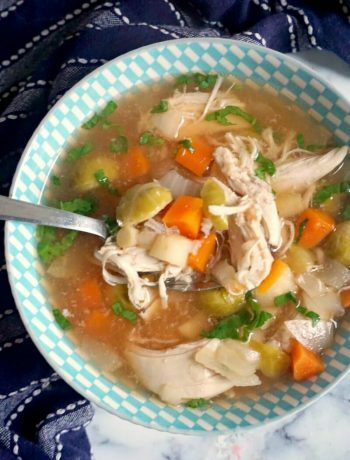 I would love to try this delicious recipe. Sounds so yummy. Thank you, Lisa! I’m sure the kids will love it! ?